…and get to accept the coveted GERMAN INNOVATION AWARD from the German Design Council in Berlin. 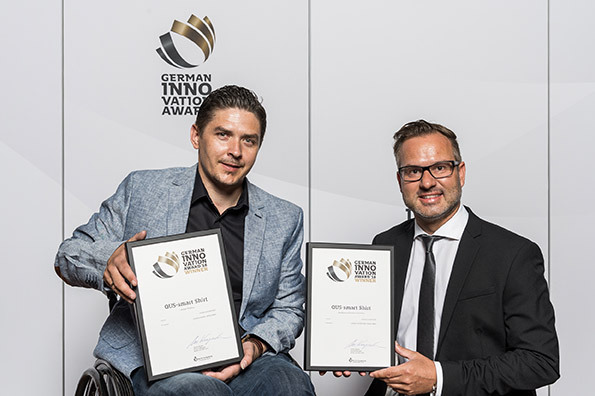 The German Innovation Award distinguishes products and solutions which differ from previous solutions based on their focus on users and their added value. Because: innovations that shape the future and improve lives exist in all sectors. Sometimes one can spot them at first glance – but frequently that is not the case. The German Innovation Award seeks to change that. It makes remarkable performances visible to a broad audience and ensures a successful position on the market. The process of the German Innovation Award is unique: solely businesses that were nominated by the expert committees and scouts of the German Design Council can compete. This process ensures the independence and excellence of the award. The German Innovation Award 2018 is awarded in two competition classes: “Excellence in Business to Consumer” as well as “Excellence in Business to Business”. What is more, projects that made use of agile innovation methods such as Design Thinking, Scrum, Lean Startup or Sprint on their path to innovation are additionally distinguished in an overarching category of “Design Thinking”. In both competition classes the jury selects a gold award winner for each category based on their excellence within the sector or discipline. The jury also awards an appropriate number of prizes in each category. Additionally, the jury bestows the title “Special Mention” for special aspects of product innovation. The German Innovation Award has achieved a remarkable result with 650 submissions in the first year. Almost 40% of these took part in the §Excellence in Business to Consumer” class, while around 60% fell into the “Excellence in Business to Business” class. A total of 34 products/projects were awarded “Gold” in both classes, one of which fell into the special category of “Design Thinking”. The jury is constituted of independent, inter-disciplinary experts from the industry, science, institutions and business finance. Andrej Kupetz, who is the managing director of the German Design Council, presides over the jury. The evaluation of the submissions follows the criteria of level of innovation, user value, and economic viability. The innovation strategy should take aspects such as social, ecological and economic sustainability as well as the use of energy and resources into account. Factors such as the potential of the location and employability, durability, market maturity, technical quality and function, materiality and synergy effects also play a decisive role in the judging process. Initiated by the German parliament and endowed by the German industry, the Design Council, as an independent and internationally active institution, promotes businesses in their competitiveness. With its competitions, exhibitions, conferences, seminars, and publications it offers an essential contribution to the knowledge transfer surrounding the topic of design. Since 1953 the competitions by the Design Council have been distinguishing design, brand and innovation performances of international rank. The circle of sponsors of the Design Council includes over 300 national and international businesses who employ more than three million employees.